Activist investor Searchlight Capital Partners (Searchlight) has confirmed its intention to acquire a 26% stake in Latecoere, the French aeronautics company, through the acquisition of existing stakes held by Apollo Capital Management, Monarch Alternative Capital and CVI Partners, at a price of US$4.31 (€3.85) per share. The total investment is valued at US$106.8 million. A number of French companies have been targeted by so-called Activist investors who feel they have been underperforming, including Elliott, which is piling pressure on drinks group Pernod, CIAM is tussling with reinsurer Scor, and Amber Capital has acquired a stake in Lagardere, according to Reuters. Latecoere cut its earnings outlook last December after start-up costs related to new contracts hit its margins and cash flow, although the company’s latest set of results earlier this month showed signs of a recovery. Latecoere said it welcomed Searchlight’s move and its presence on its board of directors. “The company welcomes this proposed transaction, Searchlight having shown on this occasion its support for the strategy proposed by management and approved by the board of directors,” Latecoere said in a statement. It is understood that Searchlight will propose three candidates to join the board of directors. Aircastle has named Douglas Winter as Chief Commercial Officer of its affiliate, Aircastle Advisor LLC. He will join the company at the end of April. Winter will succeed Michael Kriedberg, who will become a senior advisor through the remainder of 2019 in order to ensure a smooth transition. Kriedberg previously announced his intention to retire as of January 1, 2020. 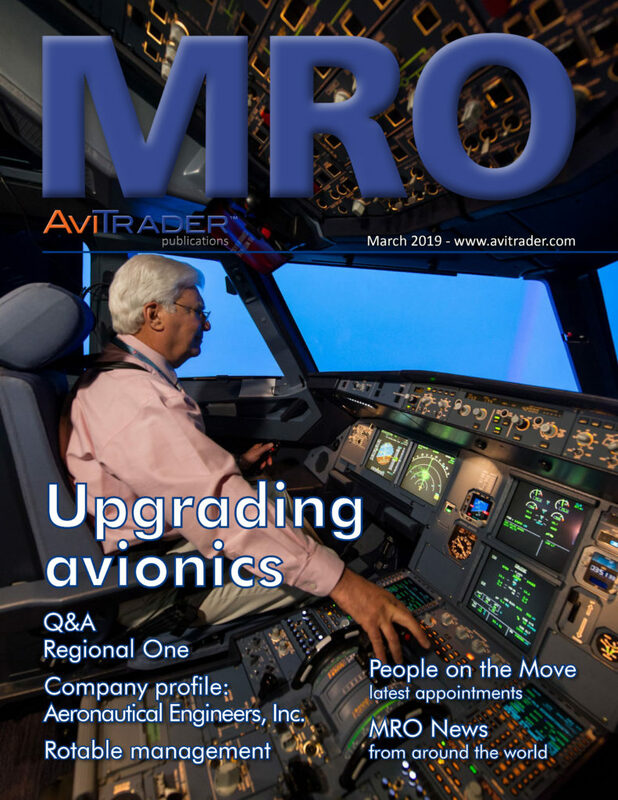 Winter has over 30 years of operations and leadership experience in the aviation industry, managing large, diverse portfolios of aircraft for market-leading lessors. Most recently, he served as Chief Executive Officer of global aircraft leasing company Voyager Aviation (formerly Intrepid Aviation), as well as Vice Chairman of Amedeo, a leading asset management specialist. Previously, Winter has served in leadership roles with AWAS, GECAS, and Octagon Aviation. American is the launch customer for the Airspace XL bins, which provide approximately 40% more overhead storage space for passengers on board the 196-seat aircraft. In addition to equipping its new A321neos with the XL bins, American also plans to retrofit its entire in-service fleet of earlier A321 models – more than 200 aircraft – with the cabin features included on the new A321neos. Triumph Group's Aerospace Structures business unit has entered a definitive agreement to assign the contract for the manufacture of structural components for the Embraer E2 program to AeroSpace Technologies of Korea (ASTK). Bucher Aerospace, the Seattle-based branch of the international Bucher Group, has launched a half-size version of its thermally insulated galley cart, ARCTICart. Launched on the first day of the Aircraft Interiors Expo, the ATLAS half-size ARCTICart enables cabin crew to serve chilled food and drinks to passengers without the need for chillers, dry ice and other cooling devices inflight thereby reducing the weight of the aircraft and enabling airlines to make efficiency gains. it comes to ensuring food safety by reducing the risk of food contamination during ground handling and protecting food in hot climates. The half-size ARCTICart is the company’s latest innovation for airline catering. It was launched just 8 months after the full-size version of the product received Technical Standard Orders (TSO) Authorisation from the FAA. Air Canada has released that due to Transport Canada's continued closure of Canadian airspace to the Boeing 737 MAX aircraft, it has further adjusted its schedule through to May 31. The carrier anticipates it will cover 98% of previously planned flying for the month through a series of mitigation measures, schedule changes and temporary route suspensions. approval by international regulatory authorities. flying, the carrier has extended leases for aircraft which were scheduled to exit the fleet. 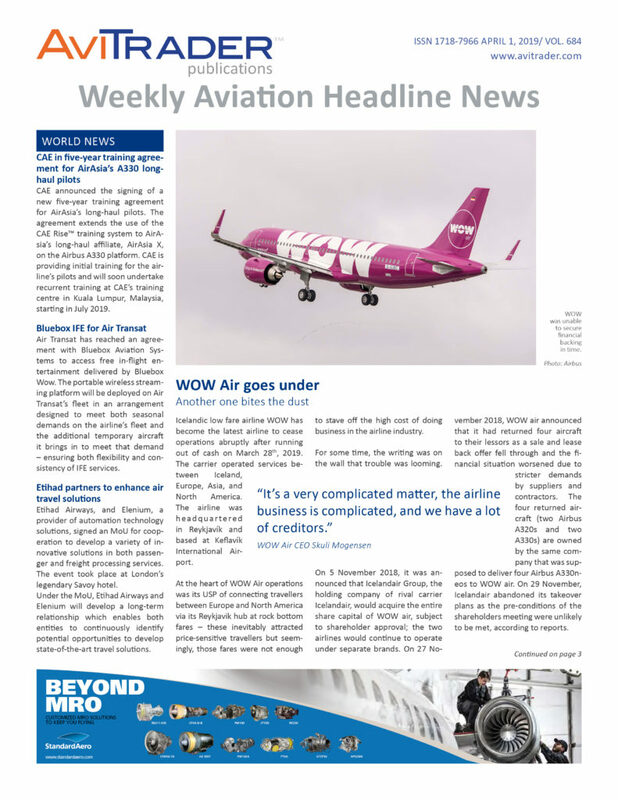 Air Canada is also accelerating the in-take of recently acquired Airbus A321 aircraft from WOW Air into its fleet. Bombardier Commercial Aircraft has released that a customer, who has requested to remain unidentified at this time, has signed an order to acquire six new Q400 aircraft. Based on the list price of the Q400 aircraft, the firm order is valued at approximately US$202 million. Baltic Ground Services (BGS), the private operator of ground handling services at Chopin Airport in Warsaw (Poland), has signed a contract with Ryanair Sun for operations in the summer of 2019 (May – October). It includes complete passenger and baggage handling as well as all necessary services. BGS will start the passenger services on April 26, 2019. The operator will service about 90 aircraft per month. BGS will employ additional 20 ground handlers to serve this contract. HAECO Cabin Solutions has unveiled its Eclipse Cabin at the Aircraft Interiors Expo in Hamburg, Germany, on April 2, 2019. During the event, HAECO Cabin Solutions has also showcased its new Eclipse seat. The launch customer − an as yet unnamed Middle East-based airline − will begin flying with the seats in 2020. The Eclipse Cabin transforms travel in short-haul business class and long-haul premium economy by utilizing an innovative layout and design. This elevates the overall passenger experience by increasing privacy and comfort while maximizing passenger places (PAX) for airlines. The Eclipse Cabin further enhances flying by providing more stowage space for amenities and crew baggage, freeing overhead bin space. Customer deliveries will commence in the first quarter of 2020 after the Eclipse Cabin has achieved FAA Technical Standard Order (TSO) certification. TAG Aviation Maintenance Services has appointed Thierry Barré as Managing Director, to be based at TAG’s primary Farnborough Airport UK location. Thierry Barré, who joins TAG’s Maintenance Services Centre with immediate effect, was previously Technical Director of a Business Jet MRO (Maintenance, Repair and Overhaul) company based in Europe and brings extensive customer relations expertise and strong MRO experience to the position. Cyrille Pillet, who was the previous MD of Farnborough Maintenance Services, will now focus his attention on the base maintenance service operations for TAG Aviation at group level. As part of TAG Aviation Maintenance Services’ harmonisation initiatives, Mr Pillet will now be responsible for overseeing operations at the two main centres of Farnborough and Geneva.